Convert any YouTube and Hulu videos for iTunes and Apple devices. Provides more than 60 universal video and audio output formats. 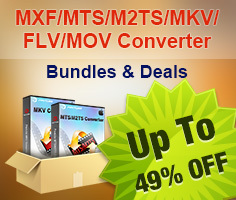 Convert FLV/ F4V/ MP4 to MOV, M4V, MP4 for iMove 09, iDVD, FCE, FCP. Pavtube FLV/F4V Converter for Mac is developed for converting FLV and F4V files to your required file types, including MOV, MPG, VOB, MKV, TS, AVI, MP4, etc. More than converting FLV and F4V files to other formats, it also features "Merge into one file" to combine multiple video clips into a single file. The FLV Converter for Mac deals with more than FLV video clips, it's also a F4V Converter and MP4 Converter that can convert and edit H.264/ MPEG-4 AVC encoded F4V and MP4 files downloaded from YouTube, Netflix, and more web videos. The FLV Converter for Mac is much tested and proved to be faster than overwhelming majority Mac FLV Converters on market. Try it out and you'll learn how fast it is. The FLV Converter for Mac adopted advanced audio and video sync technology that free you from the out of sync troubles. The program uses built-in codec and will not install any codec on your computer, so there's no concern about unexpected codec problem. With this FLV Converter for Mac, Flash videos and MP4 files downloaded from video hosting site can be easily turned into MPEG-4 and H.264 encoded MOV, M4V, MP4 of 1280*720 (Apple TV 720p, iPad HD, iPhone 4 HD, iPod Touch 4th Gen HD), 720*480 (DVD standard), 640*480, 480*320, 320*240 (earlier iPod Nano, iPhone 3G, iPod Touch) . The program's editor section allows you to get any video length you want with Trim; cut off the black edges and unwanted video area easily with Crop; merge many videos into a signal one; replace the original audio even adjust audio volume. MP4 (supported by iPod, iPad, iPhone, PSP, Apple TV, Gphone, Blackberry, Nexus One, Motorola Droid, HTC Droid, Samsung Fasinate, Samsung Galaxy S, etc. ), 3GP (supported by 3G mobile phones), FLV (suitable for online transfer), MPEG-4 (support importing to iMovie, Final Cut Pro. ), AVI, MPG, MOV, 3G2, VOB.